If you are like most people then eye-balling portions of spaghetti usually results in too little or too much once it has been cooked. It is one of those tasks that seems so simple in concept, but when it comes down to doing it, most of us get it wrong. The Spaghetti measure makes this task super easy though, and it even doubles as a serving tool too. This clever device takes all of the guess work out of portioning spaghetti, and allows you to move it from pot to plate once it is cooked. Now you can use the same tool to measure and serve your pasta. The convenient holes in the handle allow the user to accurately measure the perfect amount of spaghetti for an adult or a child. Just insert pasta into the holes before cooking to measure and be sure you are cooking the right amount. The smaller whole is a child size portion, and the larger whole is an adult size portion. You will never have piles of leftover pasta again because this easy-to-use gadget makes it simple for anyone to know they are adding the right amount of pasta to the water. The end of this measure is shaped like a traditional spaghetti fork so you can stir, serve and drain your spaghetti using the same tool. No more looking for two different tools or ending up with the wrong amount of food. Simply fill the whole with raw pasta to measure out your desired amount then continue with the same tool for cooking it. Available in red or purple. Dishwasher safe. Order Yours Today! Uses Measuring spaghetti and serving it. 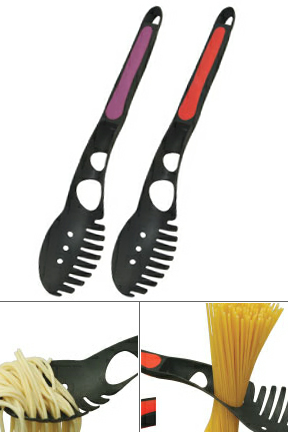 Spaghetti Measure - Measure spaghetti and serve it with the same tool. This great spaghetti fork has a built in measuring device. Get perfect portions every time. Order Yours Today. Excellent. My wife loved it.